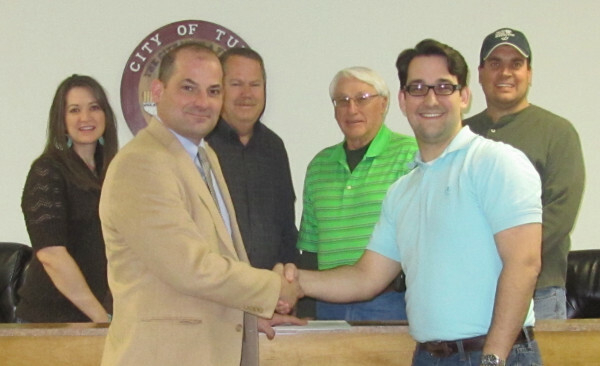 On February 28, 2014 the Tulia Economic Development Corporation (EDC) contracted with Texas Communities Group, LLC (TCG) in an effort to further the clean-up of problem properties. TCG is a consulting firm hoping to put a plan in place aimed at “value restoration”. The company out of Lubbock will work through the EDC in an effort to address Tulia’s dilapidated and abandoned properties, creatively market trust property and utilize acquired properties for potential redevelopment. TCG Director Danny Barrett stated the community will begin to notice some of the advertisement of “trust” property within the coming weeks with the placement of signs identifying the foreclosed properties for sale. TCG will then begin the process of educating the citizens on the procedures to purchase property. “Soon, a person will be able to view the inventory of trust property on the internet through a link on the city’s website” said Barrett. Code enforcement, appraisal district, and county tax office staff in addition to the community volunteer group, Tulia Citizens Working for Tulia, formed to “clean-up Tulia!” will be able to report problem properties directly to TCG for analysis to find the best process to address each problem property, be it code enforcement, tax foreclosure, or private negotiations. Barrett adds that TCG is very excited about the prospect of the venture. Tulia is the initial roll-out of the process that is admittedly in its infancy, “I want to thank Andrew and the Board of the EDC, not to mention, Cindy McDowell the Chief Appraiser, in their confidence shown in our “pilot project” here in Tulia. Having come from a small Panhandle town myself, my chief concern is in the welfare of our small communities and we look forward to putting our best foot forward here in Tulia,” said TCG’s Director.